Home / food / goldilocks / New Spicy, Healthy Treat from Goldilocks! New Spicy, Healthy Treat from Goldilocks! In recent years, studies have shown that Filipinos have become more and more conscious about their health. From new workout routines, monthly hiking trips, or simply dieting for the perfect beach getaway, Filipinos have come to embrace brand new lifestyles in order to remain fit and healthy. However, a common problem for this new way of living is the lack of variety for healthy meals as most vegetable dishes are often bland and lack that signature “Pinoy kick” which makes them delicious and fulfilling. 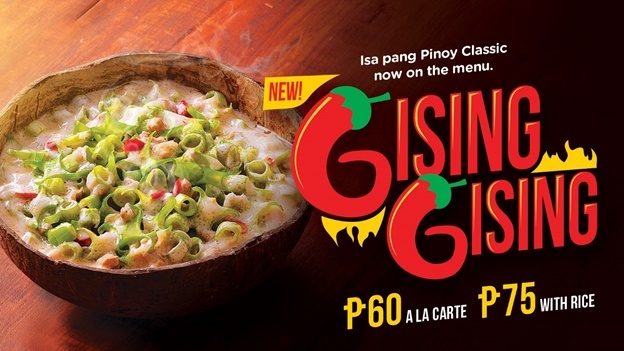 With this in mind, Goldilocks, the country’s number one bakeshop is proud to introduce their all new Gising Gising meals! Enjoy a healthy meal with an added kick with Golidlocks’ Gising Gising meals, a delicious Filipino classic dish made with nutritious ingredients such as Sigarilyas, Kangkong Stalks and Ground Beef which is then cooked in fresh Coconut Milk and Spicy Peppers to give that signature Filipino flavor! Enjoy a healthy meal with a twist with Goldilocks’ Gising Gising meals! Grab this and other Savory Pinoy products at any Golidlocks Foodstore in Luzon! For more information, you may also follow Goldilocks on Twitter or Instagram at @GoldilocksPH, on the Goldilocks Facebook page, or at the official Goldilocks website at www.goldilocks.com.ph.